Connie and I had become good friends over the years we worked together. She had been clairvoyantly challenged and experienced many physical issues, until we started to do the 5D extractions of the implants and devices that were affecting her in every way imaginable. There were a couple of big past lives in which she saw herself dance with the Dark Wizards. I understood she had been pulled further into the darkness with the implants, which disturbed her a lot. I told her I would find a fabulous life of great brilliance that she could anchor into. After the Past Life clearing session we did just that and integrated Connie’s amazing Warrior Goddess Self. After this amazing release and recalibration, Connie and I asked Grace to join us at the Hot Springs together to recharge. I was in a pool outside by myself, and as I melted into the hot mineral water, and went into a deep space within, a beautiful vision started to unfold. I took a deep breath, and decided to let it bubble up to see what wanted to come through. As it started to unfold, I saw a beautiful area with a river winding around pristine mountains. There was a group of people, high up on the embankment, several hundred feet up. I then saw what looked like an intricately carved, pagoda-like structure, which looked as though it had come straight from the fairy realm, with spirals and curly corners. It was sitting high over the river, in an area that jutted out. There were several pathways going up to the beautiful structure from different directions. The paths themselves looked like they were made of smooth, white and frosted selenite stones. The large stones were fitted together with small, bright-colored gems, set in between them, that sparkled in the sunlight. There were pedestals set in and around the grounds. Some were quite a distance back, and they seemed to be located in strategic places. 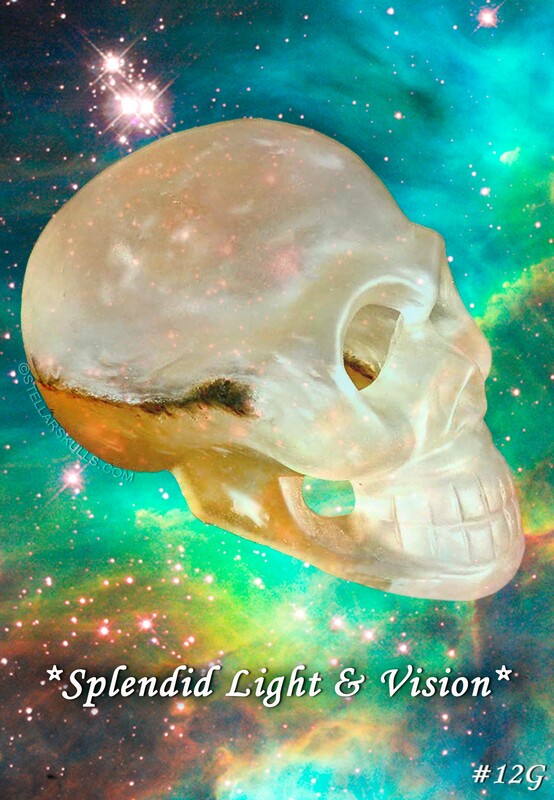 Upon each pedestal sat a beautiful, vibrant Crystalline Stellar Skull. The Skulls, which were several different colors, seemed to glow and radiate light. Connie was a man in that life, and I saw him leading a small group of Beings in beautiful, light-colored, flowing robes and capes. They came down one of the stone pathways, then climbed the steps to the platform of the six-sided pagoda ~ which was actually part of a large Merkaba. Forming a circle of twelve, with Connie in the middle, they started singing ~ and they seemed to go into a trance as they danced. The energy in the group began to build, and in one swift move, Connie sent the lower edge of his white robe flying around ~ and it lit up, as though it had a life of its own. The rolled-up hem of Connie’s robe shone with rainbow colors. When he moved, the bottom of the robe seemed to dance of its own accord. It flew through the air, and it bounced around as he started to do a beautiful movement. The others slowly started to move as well, as Connie had the lead. I was able to see brilliant colors shoot right off his robe, and they arced over the walkway right to the Crystalline Skulls ~ lighting them up even more with the dance. People started to gather, entering the area along the walkways between the Crystalline Skulls on the pedestals and the raised pagoda. The multicolored arcs of Light would create a pattern of rainbows that seemed to shower down all the colored rays, looking like Stardust coming from the dancers. The beautiful Beings on the platform were all starting to dance and sing even more. They all followed Connie’s lead, and they too sent off these shimmering rainbow arcs of Crystalline Light. The people watching started to tone and sing, and the rainbows showered over them. They seemed to sway within the rainbows of Light, gently moving around and upon the beautiful stone walkways. Everyone seemed to light up with this display of the Rainbow Light. The more I observed, the more color and energy I could see that was coming from the people who had come to observe or participate. This incredible energy expression was raising everyone’s frequencies, expanding their auras. They all seemed to come more alive. The Crystalline Skulls on the pedestals became beautiful beacons of Light, which seemed to come to life as they shone and pulsated brightly. The whole site was just extraordinary and vibrant! When the area around the Skulls and the walkways lit up completely, the dancers focused their attention upon the river itself, sending these beautiful rainbow arcs of Light into the water as it flowed by. The whole river sparkled as it lit up! The dancers, in their trance, then focused on the shores and banks of the river across from them. As their robes were swirling around and shooting off the colored lights, they sent more and more sparklers to the opposite shores. On the hills and along the shores of the river, animals began to gather. They came to experience this magnificent, heartfelt energy, which was being directed from the hearts of the dancers, to serve all those around. The people continued to dance, sway and move around, while their bodies seemed to become even more alive and responsive as the radiant Light and sound filled them. They stayed upon the stone paths, which also seemed to light up and hum. Around the skirts of this pagoda, carved wood dragons with inlaid colored stones seemed to dance in the reflections of the Light. Everything seemed so alive and vibrant as all experienced this grand display. While this cosmic dance continued ~ with the rolled ends of the robes sparkling and lighting up the platform ~ it seemed that everything around was lighting up. Even the water was sparkling now as well! All the people and the animals seemed to be in a state of bliss. The trees and vegetation all around started to glow and radiate, as all the hearts became joined together with this splendid Light.